​​As one walks on Dionyssiou Areopagitou magnificent pedestrian street which links Athens' main archaeological sites, and on the southern slope of the Sacred Rock, home to the Athenian Acropolis, one will eventually encounter the signs and steps that lead to the entrance of Herodeon, aka The Odeon of Herodes Atticos. 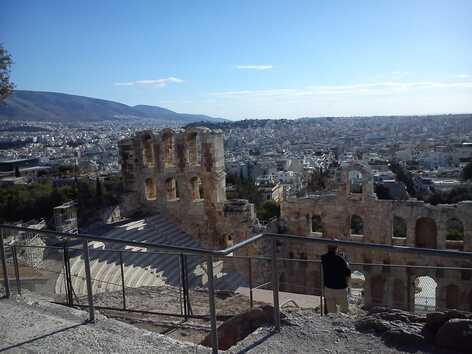 Herodeon is the second best theater in the world to watch theater, dance and music performances, according to a list entitled “Top venues for live theater,” compiled by Canadian newspaper Globe and Mail. The article mentions the Greek theater’s history and describes the theater as “the perfect location where modern music meets with the ancient atmosphere” and as “the ideal for all artists.” Topping the list is the open-air Minack Theatre in England, and following Herodeon on the list is the Sydney Opera House in Australia, La Scala in Milan, the Carnegie Hall in New York, the Bolshoi Theater in Moscow and other famous theaters in the world. The Greek theater was also at the top of a list of the world’s most spectacular theaters published in March 2017 by The Telegraph. Herodeon from above. Photo courtesy Sophia Yiannakou. The Odeon of Herodes Atticos was the third odeon of Athens. The first, and earliest, was the Odeon of Pericles. This was built very much earlier, around the middle of the 5th century B.C., and it had already been abandoned by the time the Odeon of Herodes was built. The second Odeon in Athens was the Odeon of Agrippa in the Ancient Agora, dated to around 15 B.C. After it was renovated in the middle of the 2nd century A.C., it was no longer suitable for musical events, but only for lectures. Thus Herodes’ decision to present the city with an Odeon, met a real need. Herodeon was built by the offspring of an important Athenian family, the illustrious orator and philosopher Tiberios Claudius Herod Atticos, in memory of his wife, Aspasia Annia Regilla. The exact date of construction is unknown, but it was certainly built sometime after Regilla's death and 174 AD, when the traveler and geographer Pausanias visited Athens and referred to the monument in great admiration. It was the third odeon constructed in ancient Athens, after the Pericles Odeon on the south slope (5th c.) and the Agrippa's Odeon in the ancient Agora (15 c. BC). 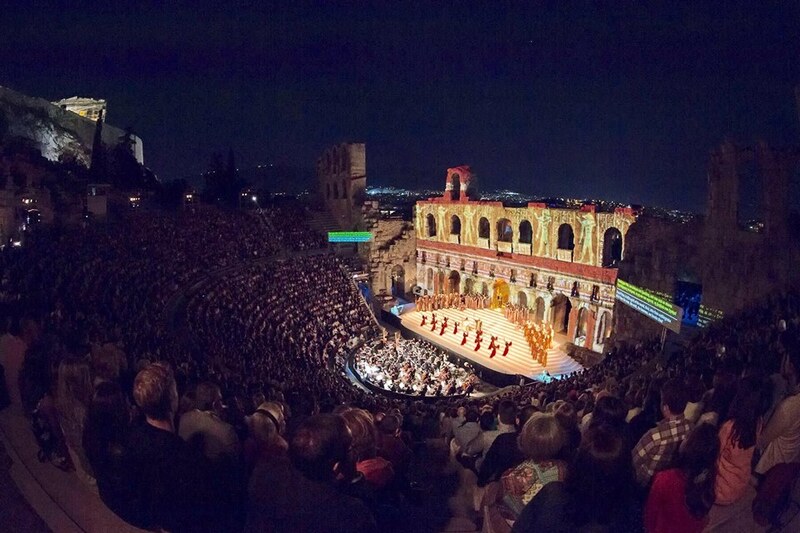 ​Herodeon is an amphitheater with a seating capacity of more than 6,000 people. It was originally a steep-sloped theater with a three-story stone front wall, decorated with marble and ceramic slabs. and a wooden roof covering the theater made of expensive cedar of Lebanon timber. The audience seats and the orchestra (stage) were restored using white marble from the quarries of Mt. Penteli in the 1950s. The semicircular auditorium, 76 m in diameter, was hollowed into the rock. It was divided into two sections by a 1.20 m wide corridor; each section (diazoma) numbered 32 rows of seats. In the front row, where dignitaries would sit, the seats had backs. The upper corridor of the cavea was probably bordered by a gallery. Also semicircular, the orchestra, 19 m in diameter, was paved with white marble. Around the orchestra was an aqueduct receiving water from the auditorium. The scene was raised and the scenic wall, preserved up to 28 m, extended over three levels. Arched openings decorated the wall's upper part, while the lower part contained several three-columned projecting porticos and niches for the placement of statues, probably those of the Muses. Above the columns there was yet another level, a sort of balcony or narrow gallery on which the gods appeared every time a tragedy or a satyrical drama was enacted. Under the scene there was a reservoir of water, maybe a wise measure against a case of fire. The scene was flanked by stairs leading to the upper section. Mosaic floors with geometrical and linear patterns covered the entrances. 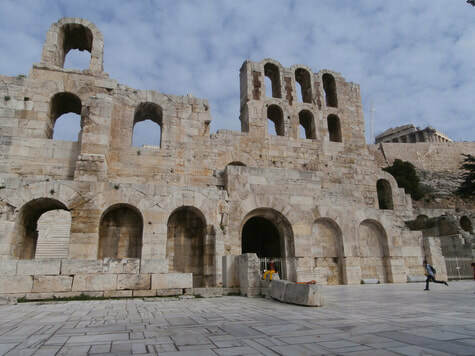 ​Herodeon was used as a venue for music concerts. It lasted intact until it was destroyed and turned into ruins in 267 BC at the incursion of the Heruli (or Erils), who burnt and flattened many buildings in ancient Athens. Later, Herodeon was incorporated within the fortifications of the city of Athens. Its south wall was made part of the post-Roman wall erected in the 3rd c. AD, whereas in the 13th c. the high scenic wall was included in the wall surrounding the Rizokastro, i.e. the base of the Acropolis hill. In the 14th c., the embankments covering the lower part of the south wall were so thick, that the entrances were not visible anymore. It was from Herodeon that the French Philhellene General Charles Nicolas Fabvier and his soldiers entered Acropolis in 1826 during the siege of Acropolis by the Turks, supplying the beleaguered defending Greeks with provisions and gunpowder. The excavations started in the mid-19th c. by the Archaeological Society and tons of earth were removed. The theater was restored during 1952-1953 using marble from the Mt. Dionysos area. ​Today Herodeon is the main venue for the annual Athens Festival, featuring a quality selection of musical concerts and classical tragedies, both Greek and international, under the night sky with a marvelous acoustic experience. Events are held from May to early October since the theater is open to the sky. Among the notable artists who have performed at the Herodeon we shall mention La Divina Maria Callas, Plácido Domingo, José Carreras, Montserrat Caballé, Luciano Pavarotti, Alicia de Larrocha, the Bolshoi Ballets, Maurice Béjart, Joaquín Cortés, Sylvie Guillem, Paco de Lucía, Diana Ross, Liza Minnelli, Jean Michel Jarre, Elton John, Ennio Morricone, Frank Sinatra, Jethro Tull, and Karolos Koun, Mikis Theodorakis, Manos Hatzidakis, Nikos Koundouros, Spiros Evangelatos, Yannis Markopoulos, Dionysis Savopoulos, Vangelis, and other important artists and artistic organizations. Rooftop view of the Acropolis from Herodion Hotel. In the vicinity, there is Herodion hotel for you, an excellent medium-size hotel just a few hundred yards away from the Acropolis and Herodeon, offering modern, elegantly decorated air-conditioned rooms, fitted with a satellite TV, safe and soundproof windows. Most of the rooms have private balconies and some have a view of the Acropolis. It has a beautiful roof garden with lounge chairs and 2 hot bathtubs with spectacular views of Athens. The rooftop restaurant is fitted with a decked terrace, serving Mediterranean cuisine with Greek influences, and a variety of cocktails. Guests can enjoy snacks and homemade desserts in the semi-outdoor area in the back garden. An indoor restaurant is also included, where breakfast is served. 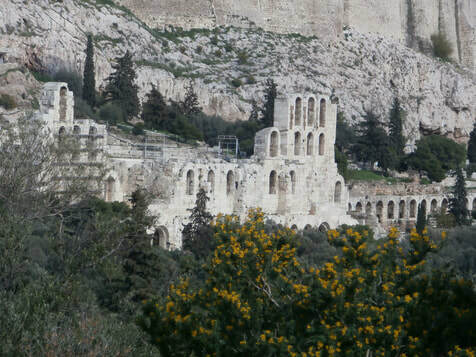 Herodeon and the Stoa of Eumenes.